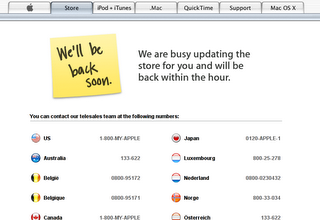 Apple Store is currently offline right now and they say "We are busy updating the store for you and will be back within the hour". But I ask them "Is it being updated for me/us really? Or is it that you are trying to get back the sales of iPods at the same level (11.8m) you had in the first quarter of 2006? Whatever the reason, the result will be new goodies being available in the store soooooooon... go fetch. Update: We are Back - Just checked Apple Store again and the website seems to be chugging along slowly(now fine, must have been initial rush). 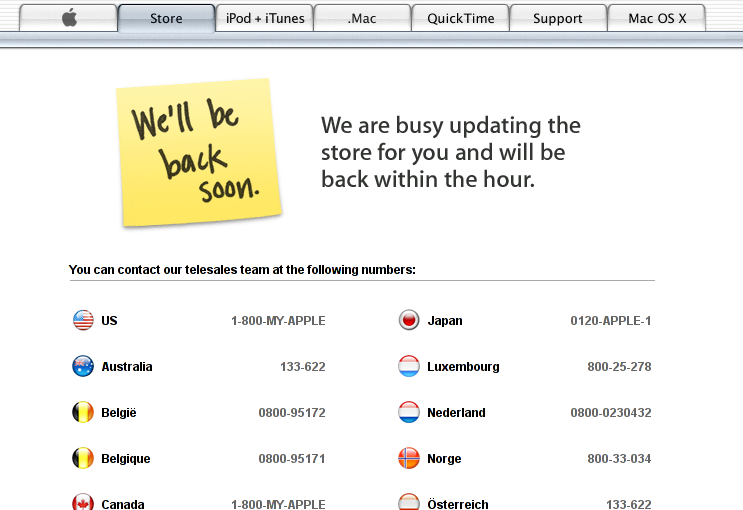 No wonder everybody is rushing to www.apple.com after Steve Jobs' annoucements of new goodies. News in the iPod Nano section: colors (for teenagers? ), 24 hour battery life, brighter screen, strong Aluminium build, 8GB Nano - yes, that's something. The Al+8GB features are tempting me to have one of those in black :( From the images on the website the news Nanos looks a lot like the Mini! Am I right or my eyes are betraying me? Update II: iPod Nano 8GB = iPod 30GB = US$249 = CA$299 ..... Interesting.